MBA or the Master of Business Administration is a degree in business administration (management) that has management training at the core with a focus on leadership, planning, business strategy, organisational behaviour, human resource management; in one word the entire acumen of running a large or small business. It is time now that we understand MBA as an urge to bring value addition and not a mere degree. Considered in this spirit, one realises the need for additional skill sets, better information processing capabilities, decision-making abilities whether in entrepreneurship or service. An MBA course has various patterns. Many of the top B Schools Management Colleges offer differently designed programmes like Full-time MBA, Executive MBA, Part-time MBA. Some also provide Correspondence Course, Distance MBA Courses, Online MBA courses. The best MBA colleges offer a mixed basket of MBA courses cut out for the needs of the students as per their requirement. The average duration of a full-time MBA could range between 1 to 2 years. The part-time programmes meant for working or otherwise occupied students could stretch up to 3 years. Sandip University offers a full time 2 years MBA programme. 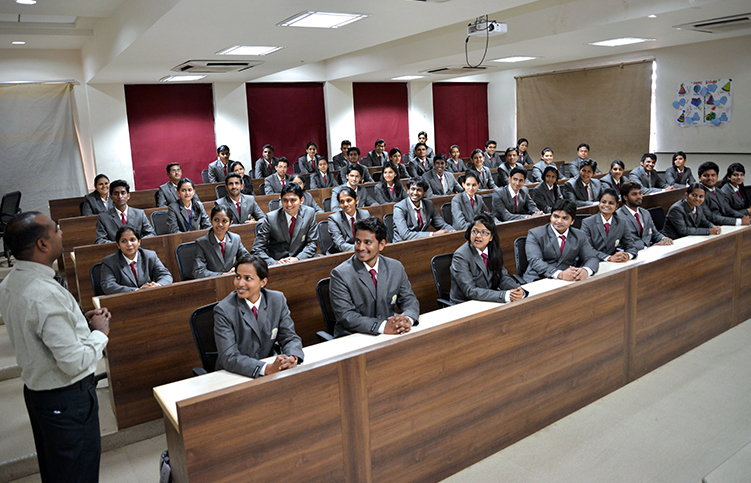 After the students get the necessary foundation by studying various subjects like Organisational Behavior, Marketing Management, Accounting, Financial Management, Economics, Human Resource, Quantitative Techniques, Production & Operations Management, Business Laws, Business Research Methods etc. In the first year, students learn all the subjects. During the second year, they need to choose out of the three specialisations. Human Resource Management or HRM course intends to help the students with human resource management skills to pursue a career in the same field. For example, planning strategies, recruitment, the hiring of employees, and training of employees and so forth. The top HR colleges offer theory and practical training in the areas of personnel administration, recruitment and selection, training and development, people and organisational development, employee relations and human resource planning. MBA Finance degree brings a student the business and financial expertise and management skill needed for any enterprise. It is a subject that involves the management, investment and resources of money as a capital required to establish or run an organisation, company or Industry. It needs a lot of planning and controlling, estimating profits and losses in advance, taking appropriate measures. The top MBA finance colleges cover, along with general management subjects, additional courses focusing specifically on financial, investment and banking topics. The MBA in Marketing Management programme provided by the top marketing schools focuses an advanced business coursework besides marketing-specific electives. Alongside the general business topics like finance, corporate management, HR, the elective subjects concentrate specifically on areas like consumer behaviour, brand management, product management, promotion management, and strategic selling. A best MBA Marketing course should serve as a foundation for career advancements like becoming marketing managers or directors, business development managers, brand managers etc. An MBA degree can help you with managerial skills in a workplace. For entrepreneurship or consultancy work, the knowledge and proficiency will come very handy in steering a business even from scratch till peak and beyond. With changing consumer behaviour, an MBA gives you the chance to experiment with and provide solutions to newer problems sharpening your management and interpersonal skills in the process. At Sandip University you will be receiving tuition from some of the best faculties in a world-class infrastructural setup. A part of your faculty will be specially invited to share their wealth of experience and knowledge with you. Your tutors and guest speakers will also bring a network of contacts for you to gain some step up within your chosen field, help you start your professional network. A professional and personal bond with the faculty and peers, some of whom would be successful later in life, may prove invaluable in your future. BE The BEST- Study in the Best School. For 2018 admission contact us right away! We are eager to help you with all your concerns and queries.